From Awards season art fare like Summer Hours to highbrow polemics masking as DVD bargain bin trash like Boarding Gate, Olivier Assayas has spent most of his career bitching about globalization through his remarkably well-made films. 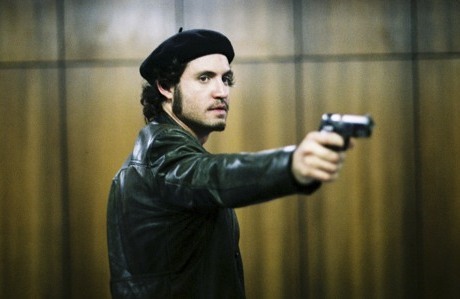 A knack for cross-cultural dialogues and tense international narratives about surreptitious business dealings gives him a natural advantage for helming such an ambitious, jet setting, epic project, spanning two decades and at least ten countries in the life of Carlos the Jackal (a name never used in the film). It's hard to imagine anyone else handling the many languages and ideological perspectives presented with such fluidity and ease. Clocking in at five-and-a-half hours – making the argument (along with Che) that all films about Latino revolutionaries need to be bloated and protracted – Carlos details the life of Ilich Ramirez Sanchez (Edgar Ramirez), from his pipedream beginnings in early '70s Venezuela to his eventual arrest in 1994 by French officials. What's in between is quite expansive, detailing his bumbling early bombings with the PFLP and assassination attempts on Jewish businessmen related to the Zionist movement, along with the infamous 1975 OPEC raid in Vienna, where he and six others, including the notorious Gabriele Krocher-Tiedemann (Julia Hummer), took oil-trading country leaders hostage and flew them to Algiers. His stationing in socialist Hungary with German revolutionary wife Magdalena Kopp (Nora von Waldstatten) and militant Johannes Weinrich (Alexander Scheer) takes up the bulk of the film, as he attempts to set-up cells throughout Europe and the Middle East in an effort to fight imperialism. Eventually, his involvement with Syrian politics and their assassination of the French Ambassador to Beirut, Louis Delamare, lead to his downfall. Magdalena Kopp is arrested in Paris during a resulting attack against the office of Al Watan Al Arabi, leading to some ill-fated emotional decisions on the part of Carlos. While the handling of various raids, bombing attempts and political negotiations are successfully dense and visceral, mixing in-the-moment propulsion with practical distance and an oddly selected, but appropriate, punk soundtrack featuring songs like "Sonic Reducer" by the Dead Boys, the latter chunk of the film is unfocused. Domestic struggles and juxtaposed dickhead actions by Carlos (such as wanton infidelity) never work, since the impetus of the film is primarily political and driven by identity. What does work quite well, however, is the constant reminder of hypocrisy and compromise, with Carlos going on an anti-Semitic rant about the evils of Zionism and then trying similarly to create his own international federation of socialists. He also whines about the evils of Western greed and then promptly accepts several million dollars from Arab officials for the release of those kidnapped at OPEC, later following up an anti-imperialism speech by telling his wife Magdalena that she can't be involved in revolutionary actions until he says so.